Housing and Urban Development Secretary Ben Carson tours the HELP of Southern Nevada Shannon West Homeless Youth center, April 25, 2018, in Las Vegas. 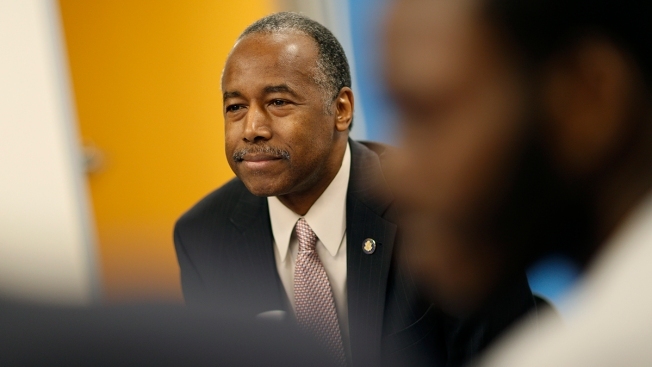 An NBC News investigation has found that more than 1,000 out of HUD’s nearly 28,000 federally subsidized multifamily properties failed their most recent inspection — a failure rate that is more than 30 percent higher than in 2016, according to an analysis of HUD records. From his earliest days in office, HUD Secretary Ben Carson has repeatedly said he joined the Trump administration to fix the “rats, roaches, bed bugs, mold, lead and violence” that he witnessed as a surgeon in low-income communities. Under the Trump administration, the number of HUD apartments cited for unsafe, unhealthy and physically deteriorating living conditions has been on the rise. HUD notes that the vast majority of federally subsidized apartments — more than 96 percent — passed inspection. The department says the recent increase in failing properties is due to changes previously made to strengthen the inspection system. After lawmakers led by Sen. Marco Rubio, R-Fla., drew attention to poor conditions in other privately owned Section 8 properties, including some with passing scores, HUD tightened its standards for repairs and for certifying inspectors in 2016. The department is continuing to overhaul the process, according to HUD spokesman Brian Sullivan.